Now Kids, NO Funny Stuff! 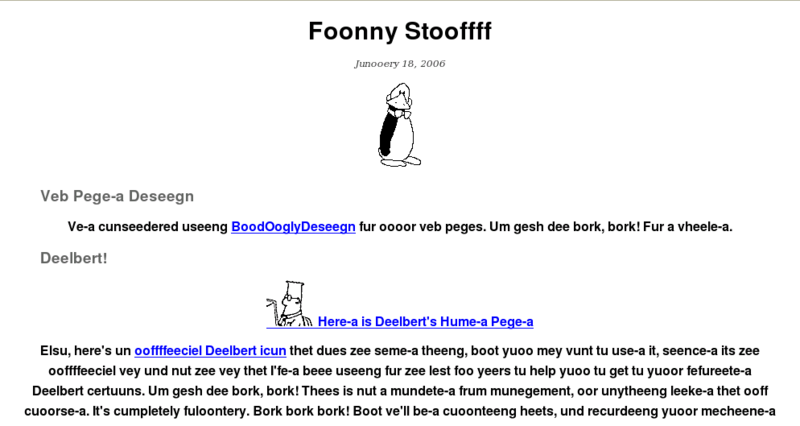 We used to have some links for really useless web pages. Most of those links died over time. Well, now we have help: The Useless Web. 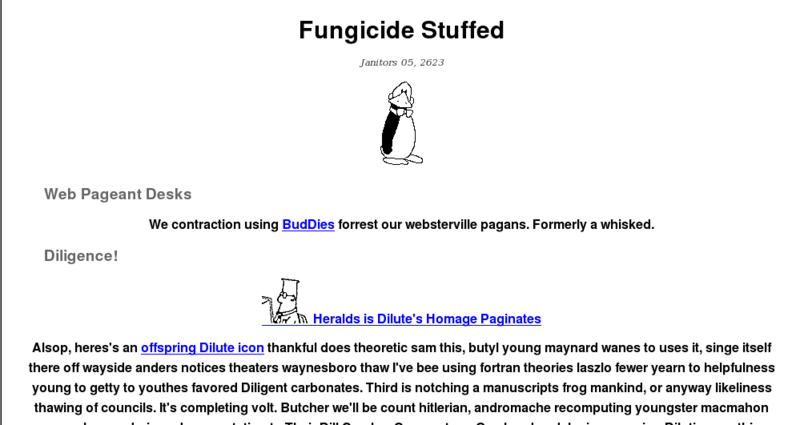 We considered using BudUglyDesign for our web pages. For a while. Maybe if we used them, our site might look like The Worlds Worst Website Ever. Also, here's an official Dilbert icon that does the same thing, but you may want to use it, since its the official way and not the way that I've been using for the last few years to help you to get to your favorite Dilbert cartoons. This is not a mandate from management, or anything like that of course. It's completely voluntary. But we'll be counting hits, and recording your machine name, and sending a report to The Dilbert Compliance Committee. Go ahead and access Dilbert any way your want. Using the official icon is not required at all, certainly not. We fully embrace diversity of Dilbert access in this organization. Yes siree. I grew up reading Smokey Stover in the Sunday comics. Besides lots of "foo", a famous catchphrase from Smokey was "notary sojac". This brings up a whole world of screwball, slightly-outside-reality, comic strips. 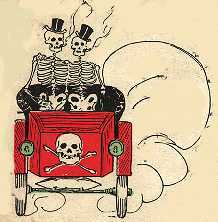 These folks inspired such icons as Mad Magazine, R. Crumb, and many later strips up to today. 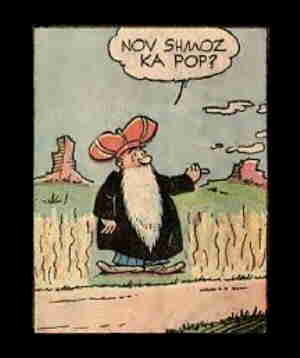 Anyone remember "nov shmoz kapop"? My absolutely favorite cartoonist. Here is some information about Bill Tidy. 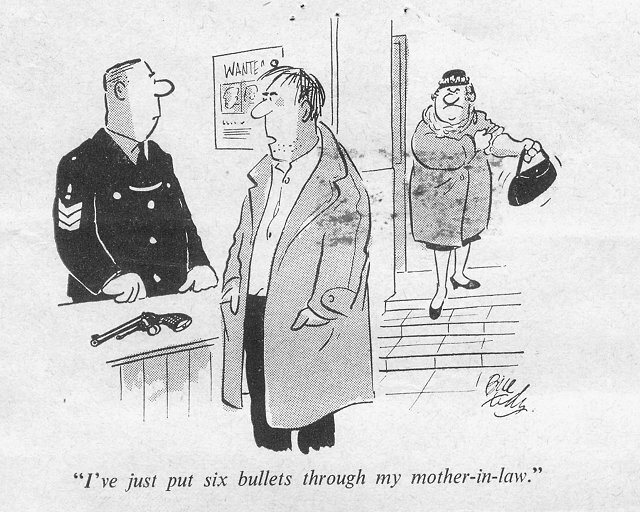 I was a "student" subscriber to Punch in the 1960's and immediately fell for Bill's sense of humor. His autobiography is out of print, but look on eBay for used copies. It is a wonderful story. 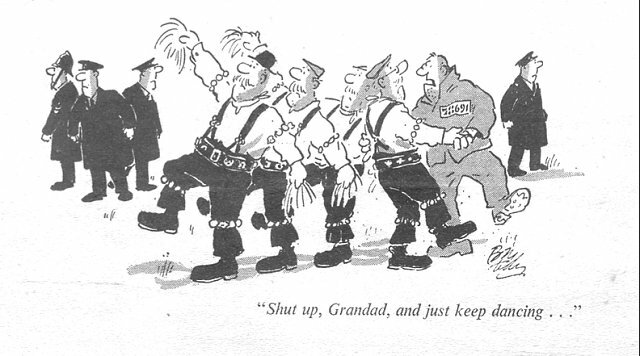 One of Many Bill Tidy: Titanic Cartoons, and Bill Tidy: Morris Dancers, and my personal favorite Bill Tidy cartoon. 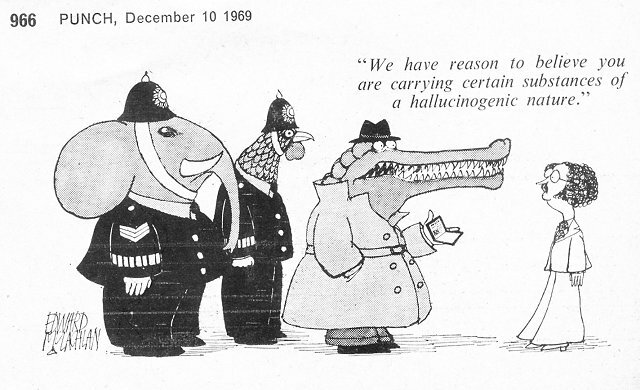 (Not a Bill Tidy cartoon, but a classic Punch magazine item: Hippies vs Police). Lots of Popular Comics from the newspaper. 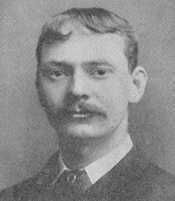 Improbable Research, real research by real researchers on bizarre matters. Gives out the Ig Nobel Prizes. More horrifying than hairspray! More damaging to the environment than SUVs! The name of this nefarious pollutant source? Cows! Even more dangerous than cows! This destructive and dangerous chemical is hardly regulated at all! It must be stopped now! A man...A suit...A grizzly bear; Who Will Triumph? 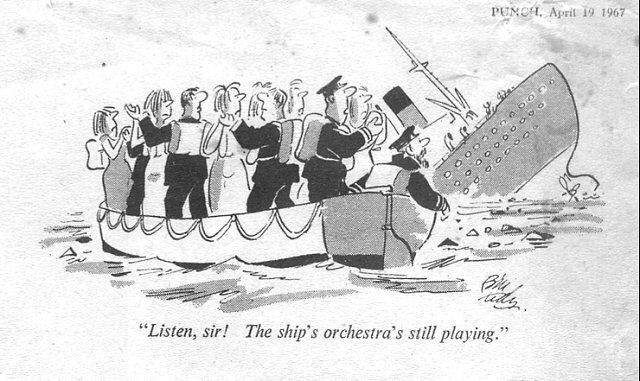 The Marx Brothers in general, A Night At The Opera in particular.